All the pages on this website have some connection with Henry Penn. 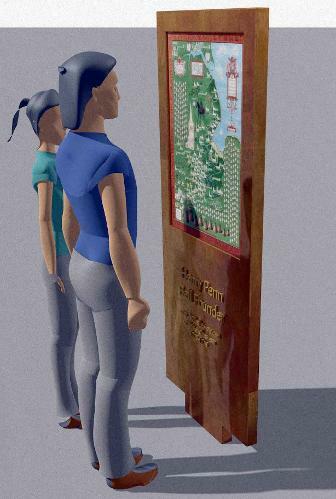 As the research progressed many paths were crossed. Listen to this early recording of the five largest bells that Henry Penn cast. 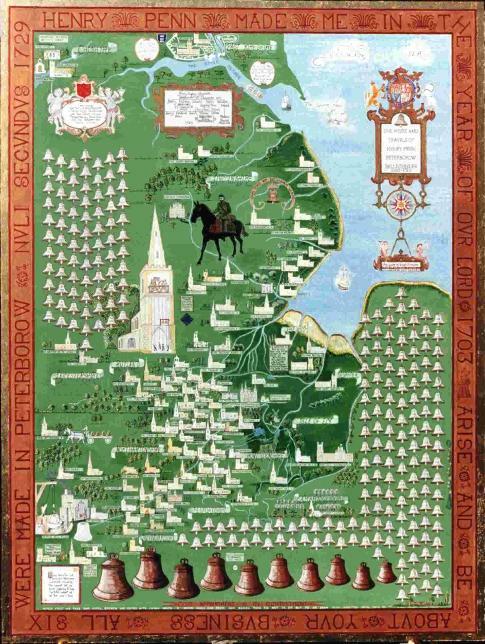 Thomas Eyre's map of 1723 showing the City. The Cathedral can be seen upper right. 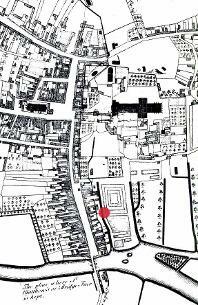 The site of Henry Penn's foundry is marked with a red dot, near to Bell Dyke. It was on this dyke he floated his bells onto the river by barge and on to their destinations. 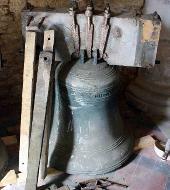 This is the same bell as it was hung in the cathedral. Sadly its canons were removed in 1898 and the bell was mounted directly onto the wooden headstock. The wooden stay projecting upwards allows the bell to be set in the upside-down position against the slider for use in change ringing. 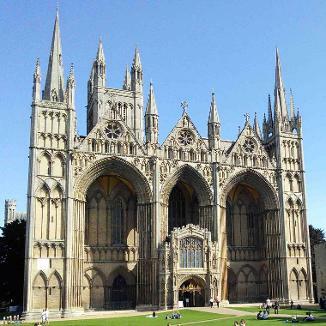 Like many Henry Penn (1685-1729) came to Peterborough for work. He was a skilled bellfounder with a prize in mind. 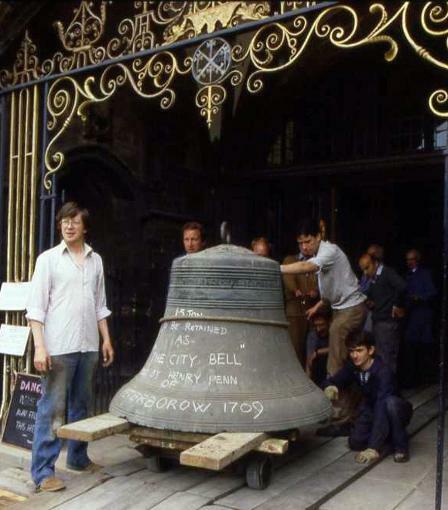 The prize was the formidable task of casting a set of ten bells for the Cathedral. Penn was just one of a number of bellfounders in the area. Today there are just two in the whole of the British Isles. This twenty four year old was very sure of himself and if he could scoop this contract his future as a top ranking tradesman would be assured. He had served his apprenticeship under his uncle Henry Bagley at a Bell Foundry at Ecton in Northamptonshire. It was in this foundry, back in 1687, the first ring of ten bells ever to be rung in peal (an octave plus two notes) was new cast for Lichfield Cathedral. Penn was only two years old at this time but it was with this fact and with his masters tools he was able to secure and undertake the task of the first ring of ten bells in Northamptonshire nearly 300 years ago. Both these peals of 10 bells were tuned to the key of D major. He may have be the first heavy engineer of Eastern Industry Peterborough. 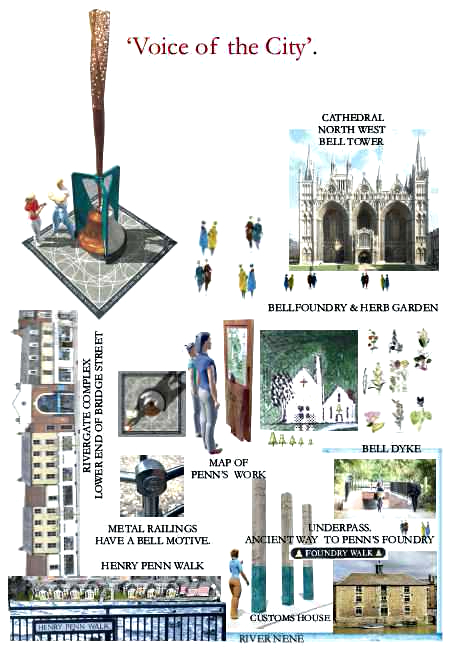 Left the Penn Map shows the 100 known places in thirteen counties for which Penn cast bells. He was the most prolific bellfounder of his time considering he was only 44 when he died. An American Connections. 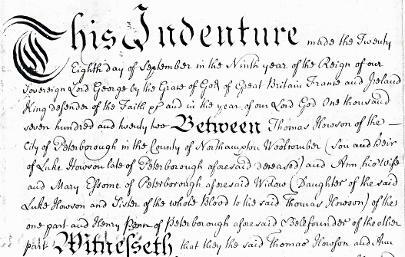 Benjamin Franklin (born 1706) had family connections in the village of Ecton Northamptonshire. His Grandfather Thomas was the Blacksmith. After his death his son Thomas continued working as a blacksmith. 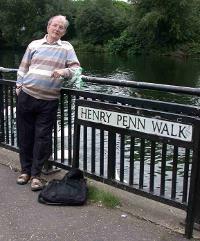 Henry Bagley bellfounder, Henry Penn’s uncle, joined him in the village in 1687 to help with the bells for Lichfield. Pittsburgh City Bell. Henry Penn was thought to be related to the Penn founders. This was found not to be the case. 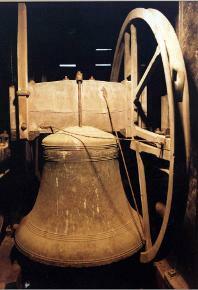 The scheme was never honoured and the 1709 bell has languished in a Pittsburgh store. This is rather shortsighted as many other Penns and their families from this country helped to build America, the place it is today. Plaster cast of the treble bell made at Holcot All Saints in Northamptonshire. This was the first and last time he used it. Horizontally behind 1703 is what looks like an Angel. This man needed an Angel as he had to cross many difficult pathways in his lifetime. 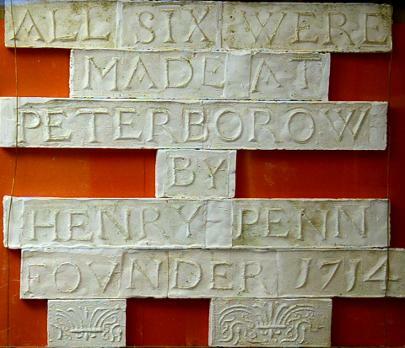 ALL SIX WERE MADE AT PETERBOROW BY HENRY PENN FOUNDER 1714. Plaster casts made at St. Peter & Paul at Wrangle in Lincolnshire. Peterborow is the old spelling for the city. One can see decorative work between the lettering at both Holcot & Wrangle. This is exactly the same as his master Henry Bagley when he cast six bells for Castor Northanptonshire in 1700. In the mist. Fotheringhay, Northamptonshire. Before we had modern communication technology bells were most important in towns and villages. One of these was the Curfew Bell rung at dusk, when people should be at home. French (couvre-few) meaning a cover for the fire. In this country the fire stayed lit all year round. Just covered at night for safety. Workers could be out in the fields or on the Fens not able to find their way home. If this was the case a relative could go to the church or cathedral, inform the curfew ringer who would continue ringing the bell until the person or persons were home and safe. Many have been saved in this way. Some gave large donations to the church concerned. Just a few of many other bell signals. Fire bell-Warning of fire. Passing bell- whilst a person was dying. 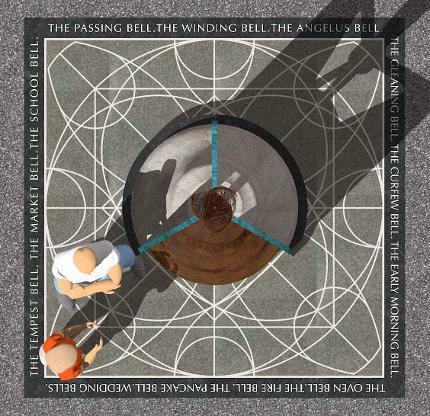 Winding bell- wind the dead person in a shroud. School bell- we all know that. Oven bell- the baker had finished and one could take their dinner to be cooked at his bake-house. Early morning bell- before the factory siren- arise and be about you business one of Penn's famous inscriptions on bells. Angelus bell- Hail Mary full of Grace! All stop where they are for prayer. Service bell- rung for service, especially weddings. ‘The Voice of the City’ is a depiction of a bell in the stages of being cast. It is a monument and tribute to Henry Penn (1685-1729). We could call him the first heavy engineer of Eastern Industry where today there are many more hardworking men and women. Penn’s life was relatively short, just 44 years, but during this period he worked and cast bells for as many as 100 churches and houses. Most of these places are shown on the map in the bronze upright case. The painting took the writer some years to complete. 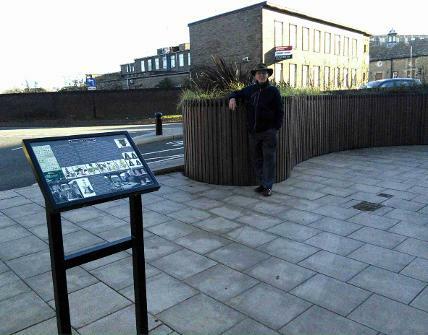 The writer has been helping Stephen Broadbent who designed and erected the ‘Voice of the City’ and acted as his historical adviser. there would be no ‘Voice of the City’. Today we have all kinds of electronic media but in yesteryear messages were sent out mainly by the differing sounds of bells. Three totem poles have been erected near to the underpass now named ‘Foundry Walk’. The nameplates include two golden bells. It leads to the site of Penn’s bellfoundry and the cathedral herb gardens. Penn and I, his biographer, have in a way been honoured which makes me feel very proud. Eight of the children of Dinah and Henry were christened at St. John’s Church near to the Market Square that must make them Peterborians like this old boy who came to the city in the 1930s. Below- drawings made by the Broadbent team. Set into the bronze upright case left are exact copies of the plaster casts shown above. Right the pavement surrounded by bell inscriptions. On the base of the map . The complete display/monument. Three strickles, bell mould former's coloured blue. Pivoted at the top and bottom they are pulled around wet clay to form the moulds. First strickel forms what is is known as the core. Second the model of the bell to be cast and the third the cope shown in the display. 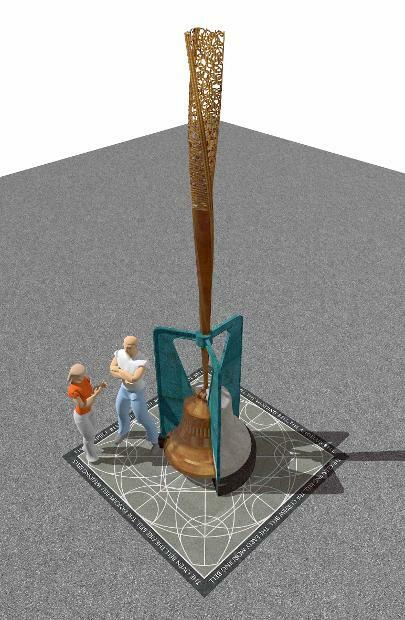 The plume above represents bronze bell metal being poured in. A cutout shows the bell that has been cast. The photo right is the day of the opening 20 December 2017. This historian stands proud. I must thank The Greater Peterborough Enterprise Partnership & the City Council, especially their Planning Department. the north -west embankment of the River Nene was named in 1984. The writer is Henry Penn's biographer. He is a bit of a romantic as he is wondering if Penn is watching . Below the walk with thanks to Google Earth. The Planter. Representing the Quay from which Penn floated his bells. 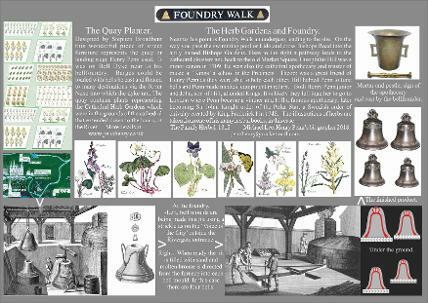 The display shows details of the herb gardens and foundry and also how a bell would have been cast. A 'GHOST' AT THE WHITE HART PETERBOROUGH. The White Hart, once a Public House in Long Causeway Peterborough, (left) stands very near to the Cathedral. 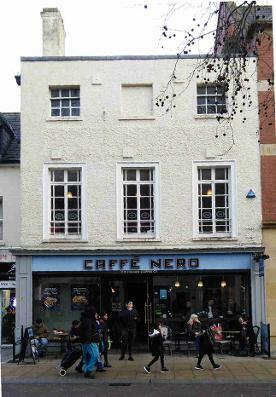 Its facade, at the base like many other buildings, has been lost and is now a cafe. It is likely the rear entrance was in the cathedral precincts, in close proximity to both Theop Hill and Henry Penn's place of work. Little is known about Penn's other medical team, Sam Pendelton (Physician) and Alex Stuart (Surgeon). Theop Hill MB Apothecary was a busy man and apart from his medical activities, was a Minor Canon at Peterborough Cathedral. He was asked to undertake many unusual tasks such as, in this case, the laying of a ghost. The following is a letter published in the Northampton Mercury April 30, 1722. It has some connection with electioneering at Peterborough. In the same year it seems that Mr. Stroud, the landlord, had invented a ghost (possibly to increase his trade) and in some way also involved himself in slander. Theop Hill may have been asked to lay this so-called ghost. These details were given to the writer by Richard Hillier, at one time an archivist at Peterborough Reference library, now retired. He is now a member of Peterborough Civic Society. The letter below was also framed and hung at the White Hart. Mr. Stroud, With more Labour than the Thing deserved, I have found your Ghost to be a Sham, and it would be no more than a Piece of Justice to the World, to declare the Truth within an Hour to Mr. Cooke, and soon after to all the Town; by this you will be prosecuted for Slander, and may be, for what I know, disgrac'd and undone. But now, by one good Action, you have the Offer from me, to make Amends for an ill one: If you will send me Word under your Hand, that you will give one Vote for Mr. Wortley, and the other (as you have promised) to Mr. Parker, I will keep your Council, and save you from all the Evil that might come upon you. And moreover, your Son shall have a King's Scholar's Place. Send me Word in three Lines you will vote for Mr. Wortley, and all is, and shall be for ever safe; and you will particularly oblige one, who is more able to serve you, than you at present suppose. Yours as you use me, Theo. Hill. Send me an Answer in half an Hour, or you are undone..
Penn cast four bells for Cotterstock pictured above in 1708. Just two remain today. In 2017 they were upgraded to a ring of six. 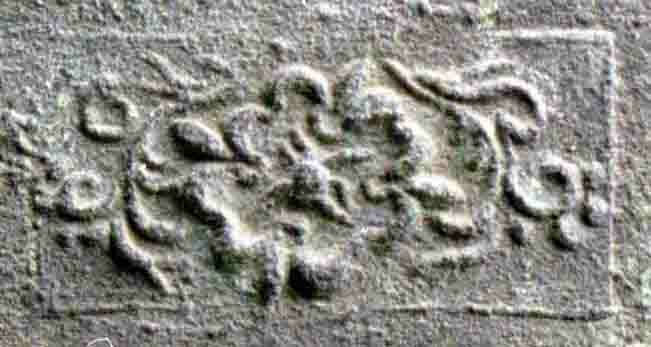 Photograph left shows the ancient treble. 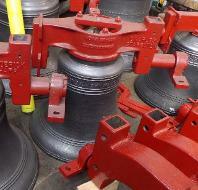 Right the same bell with canon retaining headstock ready to be lifted into the tower. The vicar at the time was the Rev John Loveling whose name is inscribed on the bell . He was also the curate at the nearby village of Glapthorn and schoolteacher at Fotheringhay where he lived in a house in the churchyard. Photo extreme right drawings of the scheme by children of Glapthorn Church of England Primary School. 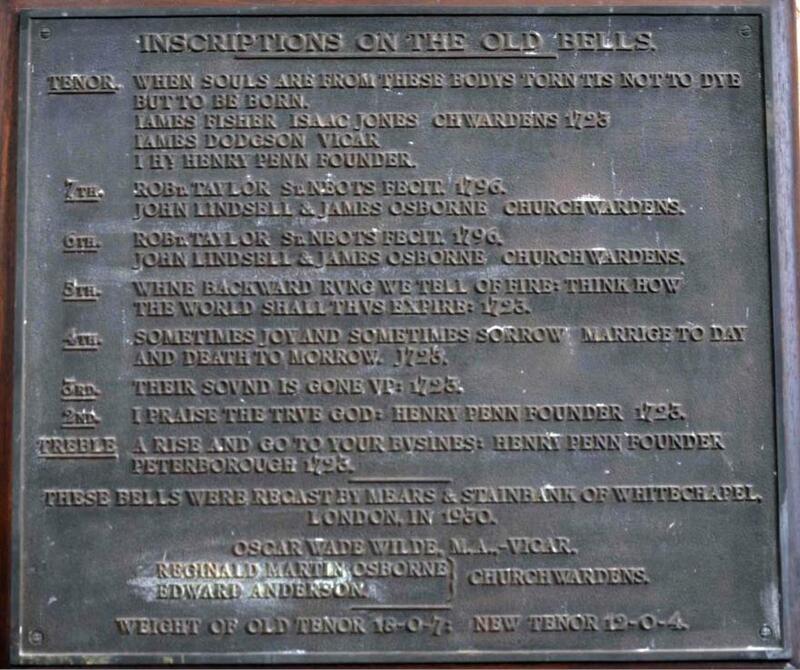 This sound file is just four of the bells including the two remaining ancient bells cast by Henry Penn. found with other Croft documents in Lincolnshire Archives. found at the hospital with 500 other bills. In 1723 Penn purchased a house. 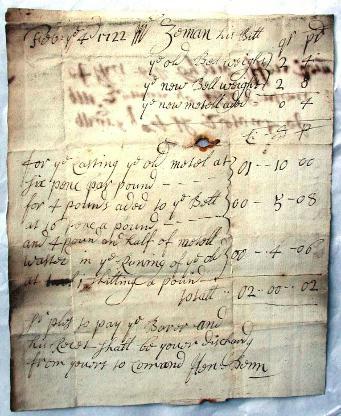 The deeds right found in the Fitzwilliam collection N.R.O, state that it is north of Westgate Peterborough. BELLS PLACE is just the right position. What did Penn look like? Left a statue of Oliver Cromwell 1599-1658. It is on the Main Street at St Ives Huntingdonshire, The writer thinks he would have dressed in this way but the clothing would have been just a little weather-worn as Penn was an itinerant horseman needing protection from the weather. It is also possible that he wore a sword or even a pistol. 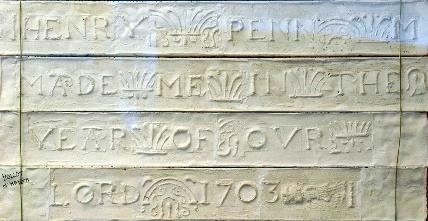 Below a plaque in St Ives Parish church gives details of a ring of eight bells cast by Penn for the church in 1723. Note that the tenor was nearly one ton. This was a bad time for Penn as the churchwardens did not fully pay him as they said the bells were not properly in tune. He died within hours of the case ending. Whilst mounting his horse in a hotel coaching yard. He was forty-four years old. This wonderful historic photograph was given to the writer and his wife by the churchwardens of Holy Trinity Church at Tichmarsh, Northamptonshire for work done to restore photographs and other documents. 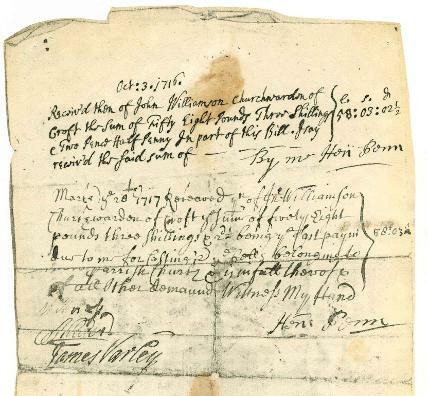 JOHN CANNARD GAVE ME JEFFERY COALES AND JOHN BARNES CHURCHWARDENS HENRY PENN MADE ME 1708. Recasting ancient bells is not allowed today 'thank goodness'. Some names of the men but not in order- L. Hankins, J. Hankins, C. Hankins, A. Mabutt, F. Mabutt, F. Glover, and J. Smith. We found some of these names on the village 1914-1918 War Memorial. God Bless Them! Please feel free to make contact regarding the contents of this site. Some publications are still available.